His Beatitude Theodoros II, Pope and Patriarch of Alexandria and All Africa celebrated the sixth anniversary of his election to the Apostolic and Patriarchal Throne of St Mark (9th October 2004 – 9th October 2010). 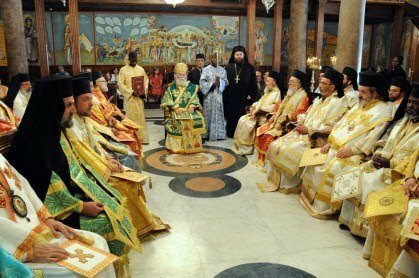 With the participation of the Members of the Holy Synod, the Bishops, the clergy and the Christian faithful, a Patriarchal and Synodal con-celebration was held at the Holy Patriarchal Church of St Savvas the Sanctified in Alexandria. The homily was preached by His Eminence Jonah of Kampala, who spoke of the productive six year tenure of His Beatitude, which gave emphasis to the development of missionary work on the African continent. Prior to the end of the Eucharistic gathering His Beatitude, in his brief speech, emotionally spoke of the day of his election, expressed his gratitude and unwavering trust in the Arch Shepherd Christ and wholeheartedly thanked the Hierarchs of the Throne, the diplomatic corps, the community and political heads of Egypt, the members of the Hellenic community and the Christian faithful for their ceaseless support which they have given him over the years. As a token of gratitude he donated an icon of the Mother of God to the Church. A festive celebration followed in the Throne Room of the Patriarchal Monastery of St Savvas, where the Archon Logothetis Mr. Spyridon Kamalakis, President of the ancient Order of the Paravalenes and Mrs. Aliki Antoniou, Chairperson of the Greek Ladies Lyceum of Alexandria, gave valuable gifts to His Beatitude the Patriarch. At noon on the same day, the Venerable Hierarch of the Alexandrian Church hosted an official lunch for the Members of the Holy Synod and his important guests. The liturgical and spiritual functions were attended by His Excellency Mr Costas Leontiou, Ambassador of Cyprus in the Land of the Nile, Mrs. Cleopatra Diakofotakis representing the Honourable Consul General of Greece in Alexandria, representatives of the Hellenic Communities of Alexandria and Cairo, the Archon Logothetis Mr Spyridon Kamalakis, office bearers of the Throne, University lecturers, teachers, representatives of Hellenic and Arab-speaking societies and associations as well as a representation of the Hellenic Scouts of Alexandria.